We are the experts in garage organization. Our team has transformed garages into beautiful, efficient spaces utilizing high quality, industrial grade garage floor coatings, ‘real’ garage cabinets, and organizer systems along with years of garage renovation expertise, and has also participated in the Extreme Makeover Home Edition. 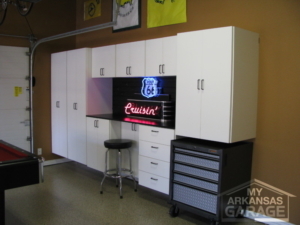 Our Custom Storage Garage Cabinets provide an attractive, durable & affordable home personal organization system for your garage. All of our Design Storage Cabinets feature our exclusive shelf support system that dramatically increases strength and resists bowing. Cabinets are available in 12″, 16″, 24″, and 30″ depths and widths of 1′, 2′, 3′, & 4′. Just to name a few: these may be customized into Sports Lockers (kids and adults), Lawn & Garden Cabinets, Recycle Cabinets, and Entertainment Cabinets. You may choose from Black, Chocolate Apple, Grey, Maple, Unfinished or White Cabinets. 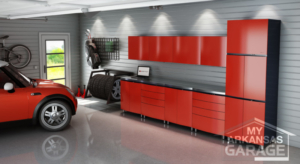 We customize garages…any style, any color, any size. Let the experts make it more than just a garage! We design, We install, YOU enjoy! Your Garage Your Way! 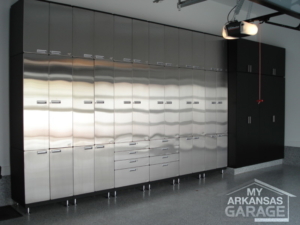 Garage storage so beautiful, your kitchen might develop an inferiority complex! 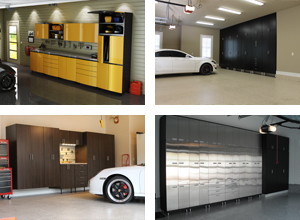 For a garage beyond your dream…combine the Stainless Steel with our Liquid Metallic Floor coating system. Beyond the garage, these work just as well for the Hobby Room, Laundry Room and Home Office. Our powder-coated cabinets are modular which allows the system to adjust to your needs. 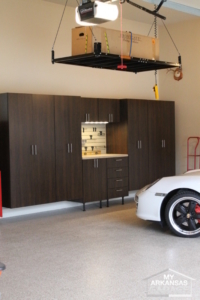 From a simple base cabinet to a full 8’ workstation our cabinetry systems can accommodate any garage. If you’re garage has high ceilings and you have a lot of items to store, you can even stack the wall cabinets on top of each other, to double the height of your wall storage. The end result is a stunning yet fully functional and modular cabinet system. Our design consultant will meet with you to measure and discuss your storage needs and will be able to design a cabinet system that will meet your needs, style and budget.